Ultrasound machines can be offered in cart-based, portable, hand-held, and tablet versions. The cart based ultrasound systems usually may have faster speeds and processing due to the allowance of more ultrasound hardware enabling to work faster, stronger, harder. Newer technology has provided laptops to have a stronger, more compelling offer with smaller components still demanding and producing incredible images. If you need leasing or even a professional loan to procure the equipment in the U.S., we can offer the assistance to get this processed. 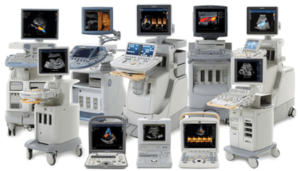 If you have particular interests in ultrasound machines, fill out the contact us page and send us a description of your needs. A small video about us is below.